1 Clean ribs and remove any silver membrane on the back or U shaped side of the ribs. 2. Combine all ingredients in a bowl and blend thoroughly. 3. Place all mix and ribs in a plastic bag. 4. 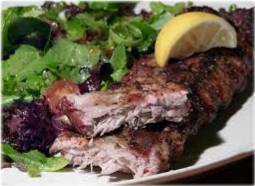 Allow ribs to marinate for 4-8 hours. 5. Preheat oven to 400 degrees or bring your BBQ grill to 300 degrees. With the BBQ grill we are going to barbecue which means to cook slowly on a moderate heat. 6. When cooking in the oven Bake at 400 degrees for approximately 10 minutes until ribs have a nice sear. 7. Reduce the heat to 300 degrees then roast for 1 hour. 8. On the BBQ grill continue cooking covered for about 2 hours at 300 degrees. 9. Check the temperature of the ribs using a meat thermometer. Check that the temperature is about 170 degrees. 10. When temperature is reached remove the ribs cover in a container and let rest for about 8-10 minutes.